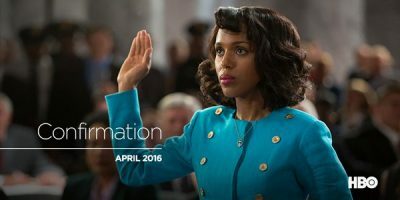 Confirmation, the story of the Supreme Court nomination hearings for Judge Clarence Thomas, which stars Kerry Washington, Wendell Pierce, and Greg Kinnear will premiere exclusively on HBO on April 16, 2016 at 8 PM (ET/PT). As previously reported, HBO Films along with executive producers Michael London, Janice Williams, Kerry Washington, and Susannah Grant; producer Darren Demetre; and director Rick Famuyiwa will provide audiences a detailed reenactment of “the explosive 1991 Clarence Thomas Supreme Court nomination hearings” in the film Confirmation. With debut date scheduled for April 16, 2016, we will finally see Kerry Washington portray law professor Anita Hill, alongside Wendell Pierce as Judge Clarence Thomas and Greg Kinnear as Democratic Senator Joe Biden. Other cast members include Jeffrey Wright, Eric Stonestreet, Jennifer Hudson, Dylan Baker, Erika Christensen, Kimberly Elise, Malcolm Gets, Grace Gummer, Bill Irwin, Zoe Lister-Jones, Peter McRobbie, Treat Williams, and Alison Wright. Confirmation was written by Susannah Grant and directed by Rick Famuyiwa. Make sure to join us on Twitter when we live tweet Confirmation when it premieres exclusively on HBO on April 16 at 8 PM ET.